Bus from Singapore to LEGOLAND® Malaysia is in rising demand for its service with the opening of LEGOLAND® Malaysia in Johor Bahru Nusajaya area. Because Johor Bahru is the neighbour of Singapore, many tourists who come to Singapore for vacation will usually spend a 1 day trip to visit LEGOLAND® Malaysia in Johor Bahru. Apart from the tourists, local Singaporeans also visit LEGOLAND® Malaysia with their family members during school holidays and weekends too. Due to the lack of public transports or bus from Singapore to LEGOLAND® Malaysia, usually visitors will buy 2-way returned bus from Singapore to LEGOLAND® Malaysia. Due to LEGOLAND® Malaysia’s location being at Nusajaya area, which is closer to Tuas checkpoint, all coaches will go through Singapore Tuas checkpoint before heading to LEGOLAND® Malaysia. For Singapore customs clearance, passengers need to come down the bus without unloading their luggage at Singapore customs. After clearing Singapore customs, passengers can board the sbus again to proceed to Malaysia customs. At Malaysia customs, passengers need to get down again for customs clearance and carry along their luggage for scanning. It usually takes about an hour from Singapore to post Malaysia customs. After Malaysia customs, it usually takes less than 10 minutes to reach LEGOLAND® Malaysia. Please bring passport and apply visa in advance should you need a visa to enter Malaysia. 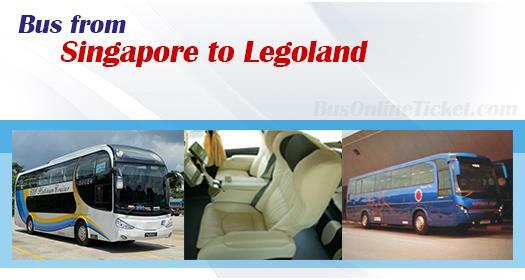 Currently, Transtar, Starmart, Superior Tour, and WTS provide daily buses from Singapore to LEGOLAND® Malaysia, as well as the return bus service. Transtar offers the most frequent schedules with various pick-up points in Singapore. Starmart on the hand offers bus from Golden Mile Complex and Boon Lay Shopping Center. Superior Tour boarding point is at Lavender MRT (exit B), in front of McDonald’s Restaurant. For WTS, the boarding point is at Singapore Flyer, where the nearest MRT is Promenade. The bus fare is in the range of SGD 1.00 – SGD 13.00 for 1-way service, depending on the pick-up point you choose and the season. LEGOLAND® Malaysia in Johor Bahru, Malaysia is the first theme park in Asia. Thus, hundreds of visitors are flocking to the theme park to enjoy their time in LEGOLAND® Malaysia. With limited bus schedules daily, visitors are encouraged to book the return bus ticket from Singapore to LEGOLAND® Malaysia in advance. All online bookings made in BusOnlineTicket.com are instantly confirmed under a secured environment.